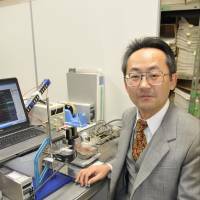 Kunio Shimada, a professor of fluid mechanics and energy engineering at Fukushima University, has developed a special rubber that can generate electricity from solar and kinetic energy and save the power generated. The 53-year-old professor, who is from the city of Fukushima, says the rubber is the first of its kind in the world and is trying to patent it in Japan. His discovery could be used to develop artificial skin for robots or shock-resistant solar batteries. Robotics experts have already shown interest in Shimada’s technology, which could become part of the prefecture’s new initiative aimed at promoting robotics. Shimada has a track record in the field of conductive rubber. In 2001, he developed a liquid that contained melted magnets, called Magnetic Compound Fluid. This time, he mixed in natural rubber, the same type used to make balloons. To turn the fluid into rubber, the common method is to heat it by mixing in sulfur, but Shimada decided to electrify the mix instead. This way, he managed to create a rubbery material that was extremely conductive. By contrast, existing solar batteries are hard and easily broken when subjected to force. Conductive rubber, however, can expand or shrink in reaction to sunlight, shock or vibration and generate power from it. 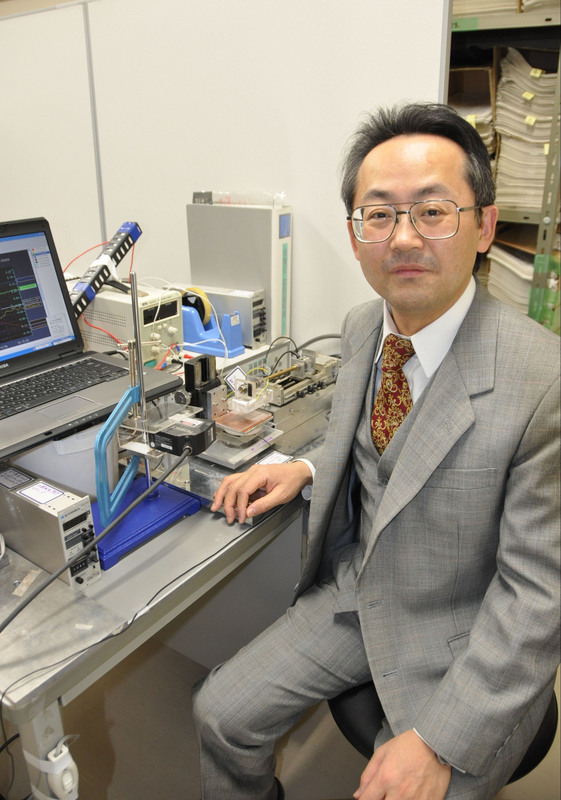 Hideki Shirakawa, professor emeritus at the University of Tsukuba, won the Nobel Prize in chemistry in 2000 by bucking the conventional wisdom that plastics are nonconductive to produce conductive polymers, which led to his creation of conductive plastic. Shimada was inspired by Shirakawa as he pursued the development of conductive rubber. According to Shimada, one of the challenges of robot development is supplying the power to run them. At the moment, wires or batteries must be attached to them. If conductive rubber can be used as their skin, however, they won’t need external power. This technology could also be applied to power drones, cars and prosthetic limbs. A Fukushima Prefectural Government official in charge of robotics promotion likewise said Shimada’s technology could change the design and specifications of robots completely. Fukushima Prefecture plans to step up robot development at the Fukushima Robot Test Field in Minamisoma from April. Officials said they hope Shimada’s research will spur related innovations at the site. This section features topics and issues from Fukushima covered by the Fukushima Minpo, the largest newspaper in Fukushima Prefecture. It was previously called Fukushima File. The original article was published on March 8.